Front office REQUIRES you to call right then and there in the lobby and change your primary care provider to thisdoctor before they will see you. Totally not required for my insurance plan as I'm not with an HMO. Classic example of front office mandatory procedures that are not necessary. Also, apparently the information that I filled out on Zodoc doesn't transmit to this particular office for some reason which meant duplication on my part. The actual doctor was friendly and seemed very comprehensive in the appointment. Front office REQUIRES you to call right then and there in the lobby and change your primary care provider to this doctor before they will see you. Totally not required formy insurance plan as I'm not with an HMO. Classic example of front office mandatory procedures that are not necessary. Also, apparently the information that I filled out on Zodoc doesn't transmit to this particular office for some reason which meant duplication on my part. The actual doctor was friendly and seemed very comprehensive in the appointment. Doctor Degan was thorough in his assessment. He was kind and engaged in conversation about things other than the reason forthe visit. It was my first time seeing Dr. Degan, but I've decided to make him my primary care physician based on today's visit. Doctor Degan was thorough in his assessment. He was kind and engaged in conversation about things other than the reason for the visit. It was my first time seeing Dr. Degan,but I've decided to make him my primary care physician based on today's visit. 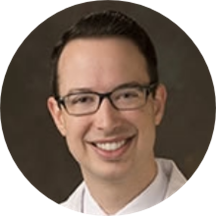 Welcoming patients of all ages, Dr. William Degan is a skilled and compassionate family physician as well as a primary care doctor. He earned his bachelor’s degree from the University of Florida, followed by a medical degree from the University of Miami. He also holds certification from the American Board of Family Medicine. Serving the community of St. Petersburg, FL, Dr. Degan is available for exams and consultations at Bayfront Primary Care, where patients visit him for a wide spectrum of common and specialized medical needs. He believes in fostering a healthy physician-patient relationship that facilitates assurance and respect. Dr. Degan has many publications on topics in his field of specialization and is also an active member of the American Academy of Family Physicians. His philosophy of patient care is based on compassion, efficacy, and teamwork. He focuses on giving patients the highest quality of care while guaranteeing their participation in managing their own medical condition. We were seen very quickly and Dr. Degan has an excellent bedside manner. I would be glad to have him as my primary form here on out. Very thorough, spent time explaining each test. Very courteous and understanding. Dr. Degan is very professional and compassionate. This was my second visit and both times he has been very thorough, taking time to discuss the issues at hand. He offers multiple options for treatment and comes up with a game planthat is best for the patient and their health/well-being. I highly recommend Dr. Degan! Dr. Degan was able to explain what was going on in an easy to understand way without being trivial. His manner as completely professional and showed concern. I didn't feel rushed! I was able to discuss different medicine options and feltI was was a partner in my care. I will say that the office staff, while very polite seemed unorganized. I came around lunch, per directions arrived half hour before my appointment and even though there were several office staff, I was greeted by a sign that said "we're at lunch" so I waited for half hour before even receiving my paperwork to complete. Additionally, I called twice to follow-up with their referral person and left messages requesting to reconnect. I never received a call back! I will continue to go back to Dr. Degan but hope that their office improves it's organization and customer support. My visit was excellent! Addressed all concerns I was having. I never go to the doctor bc I always feel like I waste my time and that the docs usually just dismiss everything. Dr Dagen actually listened and was very thorough.I also loved my nurse Myesha. I’ve never had blood drawn before but she was amazing and kept me distracted. I didn’t even feel the needle.